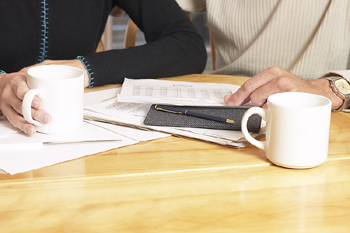 We don't have a huge investment portfolio, but we do meet with a financial advisor every year around this time. He considers us ultra-conservative investors. He's right, neither of us is fond of taking huge risks with our hard-earned money on the off-chance the return will be a little higher than we thought. But we listen to what he has to say, ask lots of questions and go over the reports he puts in front of us so we understand and are comfortable with the risks we are taking. Whether you have a substantial investment portfolio or just want to get started, consult with an expert who can help you reach your financial goals. By organizing your finances, you’ll not only save money, but make it too! · If your current investments aren’t performing well, an advisor can help you move the money around to better performing funds that earn a higher yield or give you greater dividends. · If you don’t have any investments, an expert can listen to your financial goals and recommend an investment plan for achieving those goals. Even starting off modestly will often bring you some annual dividends. Every little bit helps! Your bank or superannuation company should have a financial advisor on staff, just ring for an appointment (it shouldn't cost you anything, although with the superannuation advisors there may be a fee they will deduct from your super balance - either pay it up front or find another advisor). Remember they are advisors, you don't need to take their advice if you are uncomfortable. Shop around and do your research, and remember to ask lots of questions. And don't commit to anything until you are absolutely satisfied that it is what you want to do and you are comfortable with the risks.